A road in the Roseau, capital of Dominica, littered with structural debris, and storm debris from Hurricane Maria. The arrival of British troops in a number of overseas territories of the United Kingdom following two destructive hurricanes, were a welcome sight to the island’s residents. The northeastern portion of the Caribbean has sustained substantial damage, over a period of several days in September. The military contingent sent to Anguilla, Turks and Caicos as well as the British Virgin Islands, were equipped with medical supplies, communications and engineering equipment. The addition of the Puma helicopters will make traversing the terrain far easier, given the present sorry state of island infrastructure. The storms which devastated their domestic economies, have also enhanced the need for security as crime has risen, due to the lack of basic necessities in many areas. British Secretary of State for International Development Priti Patel being briefed by her staff on Hurricane Irma. Hurricanes Irma and then Maria, brought almost complete devastation to a number of islands. In the tropical storm season of 2017, the Leeward Islands have been particularly hard hit. The Windward Islands of the Lesser Antilles, have also been impacted. The island of Barbuda that forms an independent commonwealth with Antigua, was so heavily damaged by Hurricane Irma, that a complete evacuation ensued. With near 95% of the islands buildings and infrastructure in ruins, the island for the first time in 300 years, has been abandoned. On September 30th, a full 25 days after the storm the evacuation order was lifted, many of the locals who had fled to Antigua, have yet to return. There is little of value to return to at this point, but most former residents may want to go back eventually. A former colony of the United Kingdom, the two islands at 170 square miles (440 square kilometers) became independent in 1981. Barbuda at 62 square miles (160.56 square kilometers) had become a popular tourist destination, mainly because of its coastlines covered with pink beaches and a seabird sanctuary, along with a moderate climate. In 1995 the Category 4 Hurricane Luis, caused significant damage to Barbuda. A large number of homes were either damaged or destroyed. There were over 100 injuries and three deaths recorded at the time. Both the power and water systems were disrupted as well. Over 3,000 were left homeless and were forced to live in shelters for months. Rebuilding costs at the time, were estimated to be $100 to $350 million USD (United States Dollar). As a result of the large expense, not all the buildings would be replaced. Even as late as 2013, only two very expensive hotels were operating. In addition, there were just a few cottages for tourists to rent. When Hurricane Irma made landfall on September 06, the storm was already a Category 5. Most of the communication systems within Barbuda and contact with Antigua was destroyed. Two days later, Prime Minister Gaston Browne was ordering an evacuation of the nearly 1,800 remaining residents, ahead of a possible landfall of Category 4, Hurricane Jose. The ambassador to the United States Ronald Sanders, admitted that as a small island community, reconstruction was beyond the capability of the country, with a GDP (Gross Domestic Product) of less than $1.5 billion USD. A house on Barbuda that was badly damaged by the recent hurricane. 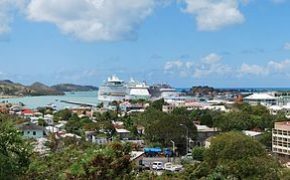 Antigua and Barbuda together have a population of near 101,000 and had a nominal per capita GDP of $15,932 USD, before the last storm season. Ambassador Sanders stated the situation was not just a disaster, but a humanitarian crisis in his appeal for international aid. He further estimated that rebuilding outlays, could range up to $300 million USD. Even at $250 million USD, it will consume more than 12% of the country’s GDP. Philmore Mullin director of disaster relief in Barbuda, believes it is overly optimistic for anything much being rebuilt in the next six months. He had never before seen the kind of ruination that he witnessed on Barbuda, in 25 years of disaster management. Island of Dominica coastline and beach. 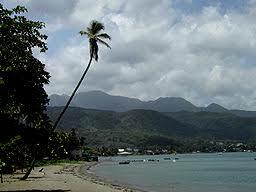 The Commonwealth of Dominica was originally colonized mostly by the French in the 1690’s. The United Kingdom would take possession in 1763. Independence would later arrive in 1978. Today the island is famous, for having the world’s second largest hot spring, known as Boiling Lake. The country has many lush mountainous rainforests and is home to many rare bird species, animals and plants. The island of Dominica has a population of over 73,000 on 290 square miles or 750 square kilometers. It is located about halfway between the French islands of Guadeloupe to the north and Martinique to the south. Chronic economic problems of the island, were compounded by the severe impact of hurricanes in 1979 and 1980. By the 1990’s, the country was dealing with a decrease in the price of bananas and a worldwide recession. 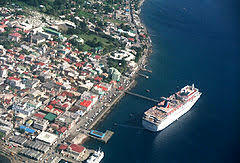 Dominica has a GDP of $521 million USD. Per capita GDP is just $7,362 USD. The economy still depends mostly on agriculture and tourism. On September 18, 2017 Dominica experienced a landfall from Hurricane Maria, at Category 5. It is estimated, that 90% of the buildings on the island have now been destroyed. It was the latest storm that has hit the region. In 1979, Hurricane David at Category 4 caused extreme and widespread damage. In August 2007, Hurricane Dean, a Category 1 storm at the time,struck the island. There followed extensive damage of the agricultural sector. Port of Call in Dominica. Then in August 2015, Tropical Storm Erika caused widespread flooding and landslides. Many communities needed to be evacuated. 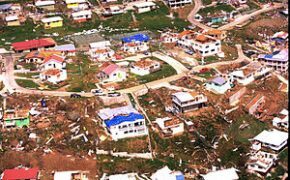 At the time, the World Bank estimated the total damages and losses from the storm were $484.82 million or near 90% of Dominica’s yearly GDP. A little over just two years later,Hurricane Maria devastated the island nation. Prime Minister Roosevelt Skerrit reported, there was not single street left unscathed. He had lost his home as well, in the storm. A total 27 people, would lose their lives as a result of Maria. The Prime Minister has since pleaded for international help. He has gone before the United Nations General Assembly, telling his peers that the desolation of his country is beyond imagination. 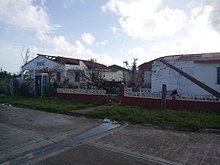 Damaged buildings in Dutch owned Sint Maarten, on September 7, 2017. In St. Martin, where France and the Netherlands split control of the island, there also has been a major impact from Hurricane Irma. A full one third of the buildings on the Dutch side in the south, were destroyed, it is estimated that near 90% of them, suffered some type of damage. On the French side, it was reported that 95% of the buildings were either damaged or destroyed. More than a dozen people have been reported killed,with hundreds still registered as missing. 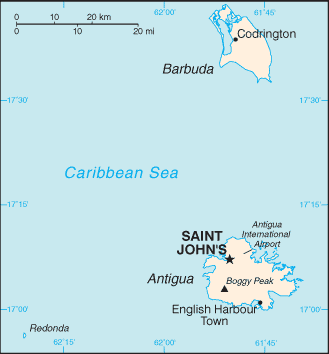 St. Martin is the world’s smallest inhabited island divided by two nations. The 34 square mile (87 square kilometer) territory is home to more than 75,000 people. Slightly more people live on the Dutch side of the border. The division of the island dates back to 1648. 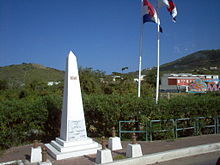 Crossing from St. Martin to Sint Maarten, dedicated in 2008. The main industry of the island remains tourism, with a full 85% of the workforce engaged in the sector. Upon assessment of the disaster, the Dutch and French both sent aid to their respective part of the island, as well as emergency personnel. Following Hurricane Irma, when it became clear that looting had become a serious issue, both France and the Netherlands sent in additional police. Princess Juliana Airport damaged itself, reopened within a couple of days, to allow incoming relief flights and for evacuees to be taken to other islands. Royal Marines delivering aid and providing support to the islanders of Jost Van Dyke, British Virgin Islands. In the British Virgin Islands both Irma and Maria caused extensive damage, but less than expected from the latter. Still, the collapse of the infrastructure, would take out communication and electricity everywhere. Virgin group founder Richard Branson, a resident of the territory himself, noted the unimaginable destruction and called for a Marshall Plan like effort, in rebuilding the British owned territory. 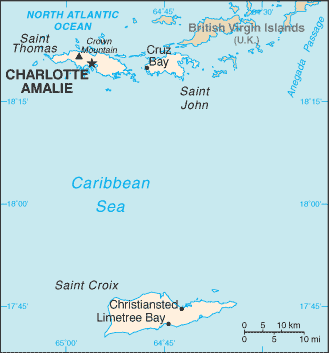 The British Virgin Islands consist of the main islands of Anegada, Jost Van Dyke, Tortola,Virgin Gorda, along with 50 other smaller islands and cays. Only about 15 of the total, are actually inhabited. The population is in excess of 30,000. The total area of the territory is 59 square miles or 153 square kilometers. British control of their portion of the Virgin Islands, can be traced back to the late 1600’s. In the era of Caribbean decolonization, beginning in the 1960’s, the island group began to diversify away, from the traditional based agriculture. Expansion of the financial services and tourist sectors of the economy, allowed the territory to become, one of the wealthiest areas in the Caribbean. Per capita GDP in Purchasing Power Parity (PPP), is a high of $43,366 USD. The currency most widely used, is actually the American dollar. Christiansted, the largest town on St. Croix in the U.S. Virgin Islands. The American Virgin Islands were known as the Danish West Indies, until their purchase by the United States in 1917. The area consists of the Saint Croix, Saint John, and Saint Thomas with a number of surrounding islands, the best known being Water Island. Hurricane Irma decimated Saint John and Saint Thomas. Governor Kenneth Mapp was at first using Saint Croix, as a base for recovery for the archipelago. The arrival of Hurricane Maria, then wrecked 70% of the buildings there as well, knocking out vital infrastructure. Relying on generators for the time being, it is estimated the restoration of the entire electric grid will be near $200 million USD. 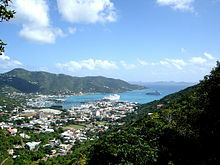 Charlotte Amalie, St. Thomas, the Islands’ capital. The costs to restore infrastructure is high, due to the number of separate islands, that will need a restoration of public services. 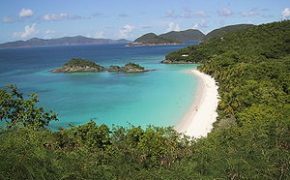 The United States Virgin Islands hosts a population of 102,951. Tourism and related activities remain the primary economic activity. Public sector jobs are 50% higher in compensation, than the average private sector jobs, which make up over 70% of the workforce. The largest employer remains the government. Even before this year’s storm season, the U.S. Virgin Islands were facing a financial crisis, due to a high debt level of $2 billion USD and a structural budget deficit of $110 million USD. The islands only main industry outside of tourism and some banking, is a significant rum manufacturing sector. In more modern times, Hurricane Hugo struck the islands in 1989, causing catastrophic physical and economic damage. St. Croix was particularly devastated by this storm. In 1995, Hurricane Marilyn would kill 8 people and caused more than $2 billion USD. Hurricane Bertha in 1996, Georges in 1998, Lenny in 1999 and Omar in 2008, were not as damaging as other storms, but each in turn, had financial costs that were difficult to meet. Trunk Bay, St. John, Virgin Island. Although the inhabitants of the islands have been United States citizens since 1927, they do not have representation in the legislature of the country. The political status of the islands remains murky, with the failure of the Fifth Constitutional Convention. In typical form, the United Nation’s Special Committee on Decolonization, has become involved in the political situation of a territory, belonging to another country. In 2016, the Special Committee recommended that the General Assembly should assist in decolonization and help the people of the United States Virgin Islands, in respect to their right to self determination. The unaccountable organization then goes further in wanting the United Nations to actively pursue, a public awareness campaign, assisting the people of the United States Virgin Islands, with their inalienable right to self determination and in gaining a better understanding of the options for self determination. This irresponsible organization and its supporters, refuse to take into consideration the economic viability and financial situation of the territories, it would like to prepare for independence. Economic long term sustainability is an important issue for the Caribbean region, where periodic catastrophic storms, will undoubtedly destroy much of the infrastructure from time to time. How independent Caribbean nations with a small territorial area and tiny population, can absorb these ongoing costs over time, is a question that has plagued the area, since the modern international push for decolonization began. If these overseas territories of Europe and the United States basically maintain their current status, the home country has a responsibility, to provide assistance in times of need. This would include when devastating storms arrive and destroy the infrastructure. A UK Royal Logistics Corp landing raft delivers emergency relief to Anguilla. In addition to short term emergency aid, the nations of France, the Netherlands the United Kingdom and even the United States, actually have the financial ability to assist, with long term reconstruction and further economic development of their dominions. As donor fatigue, effects an increasing number of countries and international agencies, run short on cash, the idea of creating new nation-states that have no long term economic viability, is totally irresponsible. This is especially the case, where there is no ground level support, for such political action. Standing water in Ponce, Puerto Rico more than a week after Hurricane Maria hit the island. The financial situation can be difficult even in larger islands, like the United States Commonwealth of Puerto Rico. The island has been under American control since 1898, when the territory was taken from Spain, after the latter was defeated in war. The islanders have been citizens of the United States, since 1917. The United States has already committed $29 billion in the reconstruction of the territory of 3.4 million citizens, after Hurricanes Irma and Maria swept through. Puerto Rico has a GDP of $103 billion USD. The island had already declared bankruptcy in May and has since been attempting to restructure, over $70 billion USD worth of debt. On September 20 and 21st Category 4 Hurricane Maria, provided a devastating blow to the island. It was the strongest storm to hit Puerto Rico in 80 years and the fifth largest ever, to land on United States territory. Almost a month later, there is still little electricity provided by the grid. Near 86% of the islands 1.57 million customers, are still without power. Gas generators are providing an ever greater number of residents,with the little power available. It may be 4 to 6 months, before full service will be restored. The problem on the island, as is the case in many parts of the Caribbean, is the infrastructure for electricity was inadequate, before the storm. PREPA, the main power company in Puerto Rico, already has a massive $9 billion debt. In July of this year, the firm defaulted on interest payments. Old San Juan. part of the historic district in the capital city of Puerto Rico. Investments in the electricity system, has been limited for years. Even without hurricanes, power outages were quite frequent on the island. Complicating matters further, there are not enough skilled technicians, to now make the necessary repairs. There is no piped water to drink or bathe in and there is still limited food. Cell service remains sporadic and many remote villages, have been isolated for weeks. The road system has been practically wiped out in many areas. Although Puerto Rico already imported 85% of its food, the storms took out near 80% of the agricultural sector. This will result in higher prices and for now, actual food shortages. Hurricane Irma had clipped the northern part of the island, two weeks earlier. Between the two storms the cost of reconstruction, has been estimated to be $45 to $90 billion USD. Young people are now exercising their option as American citizens, to move to the mainland. At the same time, older people are now retiring at a faster pace, with their employment being disrupted,for an indefinite period. Since the storm disaster, some 68 helicopters and 14,300 troops and National Guard members, are now on the ground. The United States Coast Guard and Army Corp of Engineers, are reopening more ports as well as delivering supplies, to remote villages in the mountains. 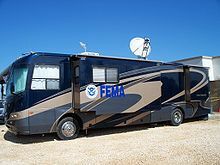 The United States Federal Emergency Management Agency (FEMA) has thousands of people on the island, coordinating general relief efforts. Millions of meals and bottles of water are being distributed regularly. The massive aid now coming to Puerto Rico would not be happening on the present scale, if the islanders had voted for independence, in previous referendums. The last one being held in 2012. 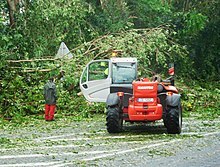 Numerous trees fell across The French territory of Guadeloupe, during Hurricane Maria, clogging roadways with debris. Many residents of island states in the Caribbean, still under European control, are becoming wise to the efforts of those, whom are still promoting independence. They are far more interesting in economic conditions and development, than the siren call of self determination. The prospect of an endless cycle of reconstruction, financed through debt and international relief, lacks appeal for many islanders in the region. There are many who question the wisdom, of relying on foreign aid, for storm recovery and further development. It also makes the independent island governments, far too dependent on the influence of major multinational corporations, wealthy businessmen and a few homegrown political families. A growing number of residents in those territories, remaining with their host countries, have simply decided that they will be better off, maintaining the political status quo. In island countries already independent, there is a growing segment of the population that now wonder, especially in times of disaster, if self government was actually in their best interest. There are even some who wistfully think, if only they could return to their former political status, they would be far better off.